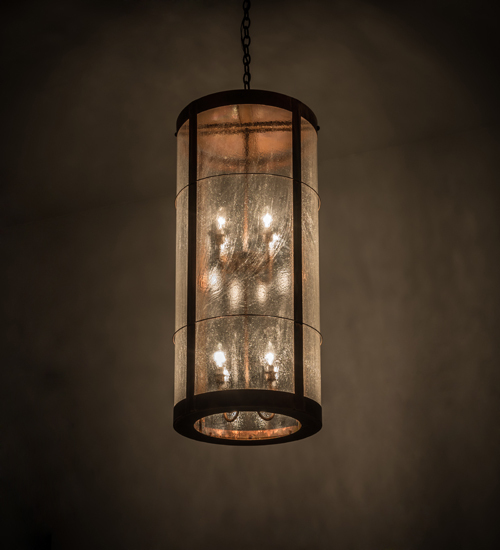 Description: Custom crafted of Brass and Copper, the handsome Villa pendant is designed with Clear Seeded glass which is complemented with accents and hardware featured in a Vintage Copper finish and a Metallic Bronze powdercoat finish. This ceiling fixture is handmade by skilled artisans in the USA and reveals two faux four-light candelabras that illuminate from within. Beautiful ambient lighting is projected using customer-supplied LED lamps for energy savings, reduced maintenance and long life. Custom sizes, styles, colors and dimmable lamping options are available. This fixture is UL and cUL listed for damp and dry locations.